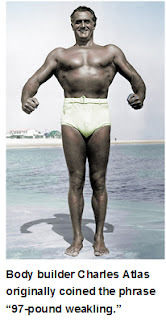 Hate being a 97-pound weakling? Now that newspapers have shed tons of excess and unsightly circulation, it’s time to take their extreme makeover to the next level by pumping up their content, circulation prices and advertising rates. Newspapers need to raise their quality and boost their prices to establish themselves as the premium products they rightfully deserve to be. It’ll do wonders for their self-esteem, too, especially in light of the latest circulation swoon. As duly reported, feebly spun and previously dissected herein, newspaper circulation has been diving on a regular basis for the last few years. The average daily circulation fell 2.1% and Sunday tumbled 3.1% in the six-month period ended in March, according to an analysis of the audited figures from the Newspaper Association of America. While some of the decline is attributable to the inroads made by new technologies and the inescapable mortality of the population cohort most amenable to print, a considerable portion of the decline results from the efforts of publishers to eliminate the discount and vanity circulation they had employed in a vain effort to make the industry appear to be more robust than it actually was. The AJC, which used to pride itself on covering Dixie like the dew, said its circulation would be reduced 5% by denying delivery to subscribers as far away as Alabama, South Carolina and Florida, not to mention many distant parts of Georgia. In the latest six-month period, the AJC’s daily circ declined by 2%. The de-dew-ification did not take effect until April 1, the last month of the half-year period. That probably means even less of Dixie will be covered six months from now. Crash circulation diets have been under way from the Bay Area of Florida to the Bay Area of California and almost everywhere in between. But diet without exercise, as we all know, just leaves you a 97-pound weakling. Newspapers need quality subscribers, which requires circulation bases that are defensible and valuable to their advertisers. Fluffed-up, mass-market numbers won’t cut it in a world where shrewd marketers are happily buying ads a click at a time at Google. Instead of relying on deep discounts and largely discredited tricks like third-party circulation, newspapers need to attract – and retain – long-term, full-price customers in the geographic and demographic areas that advertisers covet. Quality subscribers require, and deserve, quality content. Newspapers need to passionately and compassionately set the agenda in their communities, as emphasized here by David Carr in the New York Times. No other medium ever will have the content-producing capabilities of even the most resource-constrained newspaper. Newspapers should take full advantage of their unfair advantage. A quality audience reading quality content demands quality customer service. Make every customer contact count – and make sure every paper arrives safe and sound at the appointed time. Great content plus great service equals a premium product. Anyone shelling out $3.75 for a latte three times a day can afford a buck or two for a newspaper. Newspapers shouldn’t be coy about charging any less than what most people spend per day on cable TV. The same goes for online content, which the industry has been giving away for a dozen years in history’s longest running free, introductory offer. Put it all together and you have a quality product, hand-delivered each day to a loyal audience paying a premium price. Who couldn't get top ad rates for that? Loren Steffy’s heart is in the right place in his column in the Houston Chronicle decrying the decision of the Philadelphia Inquirer to let a local bank sponsor a daily wrap-up of business briefs. But his head isn’t. Well, excuse me, Loren, but advertising does indeed directly fund the content of a newspaper – and everything else, too, including payroll, paper, presses and pixels. Except for the pixels, that was the deal well before any of us got into the business. If newspapers survive as commercial enterprises, it will be the case evermore. So, get over it. The problem is that revenues are getting hard to come by, forcing newspapers (and other media companies) to get increasingly creative about what they are willing to sell – and where they are willing to sell it. And some papers, as Loren rightly notes in his must-read commentary, may be getting perilously close to the point that they would auction a writer’s oeuvre to the highest bidder. As a former business columnist and unreconstructed journalistic purist, I shuddered, too, when I heard about the Inky’s dinky plan. And I winced when I discovered at approximately the same time that a bilious green ad was squatting in the lower right corner of the cover of my hometown paper, the San Francisco Chronicle. My Chronicle happens to be owned by Hearst, the same company that owns Loren’s Chronicle. So, it’s entirely possible that he ain’t seen nothing yet. The struggle over where to draw the line between journalism and commerce isn’t new. Well before newspapers got themselves in trouble by denying the threats and opportunities of the technologies that have disrupted the once-cozy media business, publishers often leveraged the power of their presses to grub for money in unseemly ways. The biggest issue facing journalism today is not that the ever-oscillating ethical line has begun moving more erratically. The real scandal is the lack of imagination and enterprise that has forced the industry, in its desperation, into a position of increasing ethical agility, if not to say fragility. Instead of turning their account reps into feet on the street for Yahoo to buttress their sagging sales, why couldn’t newspapers have come up with the sort of creative online business being brought to market by my friend Alan Jacobson? He is starting a video classified site that he might have called Craig’s Tube but instead will be known as RealPeopleRealStuff. Alan is launching on a shoestring under the noses of some of the nation’s leading media companies. Among the clever, but not particularly ground breaking, tactics he will employ will be the viral, pass-along viewership that built YouTube into a $1.6 billion brand. In stealing a march on the powers that be, Alan is not only outsmarting them but underspending them, too. His launch budget is bound to be considerably smaller than, say, the combined expense accounts of the newspaper executives who put together the Yahoo deal. A planned operating partnership between the competing Hearst and Media News newspapers in Northern California was scrapped today, unraveled by a San Francisco civic activist with an assist from the antitrust division of the U.S. Justice Department. In a settlement to a suit challenging the pending partnership, businessman and activist Clint Reilly, the plantiff, gained an extraordinary role in overseeing the the combined group of Media News papers that together sell more than 800,000 copies a day in Northern California. Clint will get the right to review and comment on both business and editorial decisions for at least three years, according to a summary of the settlement provided by him at a press conference in San Francisco. He says he'll even get a quarter of a page in the Media News papers once a week to comment on whatever he likes. "I might call it a Clintvertorial," he quipped. Although the operating partnership in the Bay Area was derailed, Hearst will retain the right to acquire a 30% interest in Media News operations outside Northern California in exchange for buying the Monterey (CA) Herald and St. Paul Pioneer Press for approximately $263 million and giving them to Media News. Hearst had been in line to gain a 25% share in the Media News properties in Northern California but that has been scotched by the settlement, according to Clint. The development is a blow to Hearst’s money-losing San Francisco Chronicle, whose plight previously was discussed here and, by all accounts, has continued to deteriorate. Under the now-scuttled partnership, Media News and Hearst had planned to co-operate in such key areas as ad sales and newspaper distribution to drop the costs and raise the profits of their respective operations in Northern California. While the Media News properties may not be as profitable as its shareholders and investors might like them to be, they are in the black. 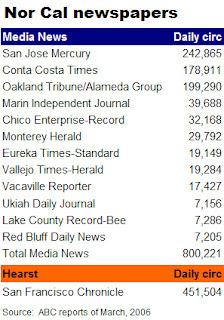 The Chronicle, on the other hand, is reportedly losing as much as $2 million a week. Its circulation was 451,504 in March, 2006, but has declined since then to less than 400,000. With the cost savings of the planned partnership off the table, both publishers may have to look to deeper savings in their existing operations in an era of declining circulation and advertising revenues. Both of the publishers already have reduced staff in most departments; Media News is outsourcing ad composition to India, and the Chronicle already has announced plans to outsource printing to a Canadian company building a new, non-unionized plant in California. The proposed collaboration of the two largest head-to-head newspaper competitors in the nation’s fifth largest media market attracted the opposition of Clint Reilly, a San Francisco real estate investor who periodically has taken an active behind-the-scenes role in local politics. Learning last year that Hearst intended to invest in the business of the Chronicle's largest competitor in Northern California, Clint filed suit in federal court, charging the deal would be an improper restraint of trade. He argued that the arrangement would reduce competition for advertising, circulation and editorial content. Clint had done all of this before. And quite successfully, too. When Hearst sought to buy the Chronicle from the founding family in 2000 for $600 million, Clint went to court to save the money-losing San Francisco Examiner, the afternoon Hearst paper that appeared likely to be shut at the completion of the acquisition. Clint’s challenge prevailed and Hearst wound up paying $66 million to a local publishing family to sustain the title. Hearst also gave Clint $2.8 million to compensate him and his attorney for their trouble. The Ex subsequently was sold to Denver billionaire Philip Anschutz and survives today as a free daily tabloid. Though Clint’s lawsuit may have been the highest-profile challenge to the contemplated Hearst-MediaNews deal, it was not the only one. Documents obtained by Clint’s lawyer in pursuing his suit against Hearst and Media News indicated that the publishers evidently weren’t going to be engaged in as much arm’s length competition as they initially represented in their public statements. This disclosure, plus the Justice Department scrutiny, evidently encouraged Media News to settle Clint’s suit on the eve of a trial that was to begin on Monday. Clint will be reimbursed for an undisclosed amount for attorney's fees and other expenses but says he will not be paid anything for the time he spent on the case or his upcoming service as the monitor of the Media News papers. There’s more to come on this one. Stay tuned. The online revenues of some of the major publicly held newspaper companies in the first quarter of this year grew at barely half the rate they advanced in the same period a year ago. With print revenues down by as much as 5% for such publishers as McClatchy in the first three months of the year, the steep, unforeseen decline in interactive sales means publishers may have to cut expenses even more drastically in the months ahead than most of them probably imagined. 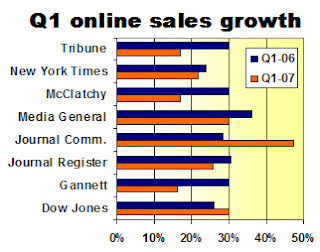 While new media sales advanced by healthy, double-digit percentages in the first three months of the year – most definitely a good thing – the year-over-year growth rate was down by nearly half at such bellwether publishers as Gannett (16% this year vs. 30% last year), McClatchy (17% vs. 30%) and Tribune (also 17% vs. 30%). As you can see below, Journal Communications and Dow Jones are the only public companies reporting a gain in online revenues so far this year. Dow Jones includes the subscription revenues of the online Wall Street Journal, which makes its performance hard to compare with the ad-supported but generally free-to-view websites operated by other publishers. Notwithstanding the weaker business experienced by the newspaper publishers, Google’s revenues, which are entirely derived from online ad sales, gained 63% in the first three months of 2007. As proof that all online behemoths are not created equal, Yahoo’s sales gained a comparatively paltry 7% in the quarter. :: First, traditional classified advertisers are migrating away from their former heavy reliance on big-ticket newspaper advertising in favor of such cost-effective and targeted digital alternatives as Monster.Com, Craig’s List, Realtors.Com or Autobytel. :: Second, sales are weak in both the auto and real estate sectors, meaning that advertisers have less to spend – or, at least, feel that they do. The lesson for publishers is that they must leverage their remaining content-creation skills, audience-building strength and sales capabilities to create new interactive (and print) products that don’t rely on their fast-eroding legacy lines of business to be successful. And it should be noted, as discussed here earlier, that a partnership selling classified ads for Yahoo is no substitute for newspapers controlling their own destinies. The television networks devoted nearly three-quarters of their newshole last week to covering the killings at Virginia Tech, aggravating the tragedy, if such a thing were possible, by upping the ante of mass hysteria across the land. 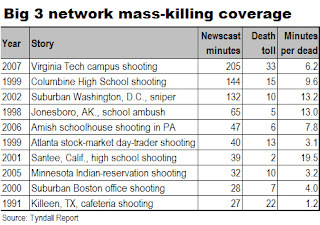 ABC, CBS and NBC squandered a record 73% of their newscasts each night last week on the VT killings, according to statistics compiled by Andrew Tyndall, who has scrupulously clocked the content of every network newscast for the last 20 years. The most recent statistics show that the average 30-minute network newscast leaves room for 18.7 minutes of actual news. The 205 minutes of VT mayhem divided by a total of 280 available minutes equals 73% of the total newshole. If similar detailed information were compiled for cable news, the metrics undoubtedly would be worse. While the VT shootings were unquestionably newsworthy, the overwrought coverage obscured many equally important events (see NBC’s two-minute rundown here) and contributed once again to the unhealthy, high-def anxiety that crime-biased TV news stokes in our society. The red-alert atmosphere generated by the media last week put students, parents, educators and law-enforcement authorities on edge. While some schools went so far as to conduct terror drills in their kindergartens, the hysteria manifested itself elsewhere in calls for metal detectors, more campus cops and chain-link fences – as though any of those things really could stop a determined, deranged assailant. The biggest hole in last week’s wall-to-wall coverage – and this includes the print, as well as the broadcast, press – was the lack of reporting on why the United States has far more guns within its borders than adult citizens. The reason, of course, is the prodigious and dangerous clout of the National Rifle Association, which has frustrated every sensible effort to disarm what ought to be one of the most civilized countries in the world. Although the network newscasts featured 49 stories on the VT killings last week, only ABC carried two pieces on the possibility that the tragedy might force some stricter federal firearm regulations, according to Andrew. There is a chance for the media to redeem themselves after this disgraceful week by putting some of their exhuberance and airtime into reporting on ways to resolve the gun epidemic. Much as I hope they do, I am not holding my breath. 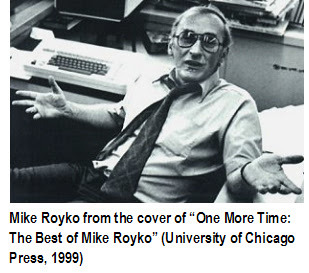 The irascible and spectacularly talented Mike Royko didn’t merely invent citizen journalism, but burnished it to a fine art in 32 years as the premiere newspaper columnist in the nation. The Pulitzer Prize winner died 10 years ago this month at the increasingly youthful-sounding age of 64. He deserves to be remembered not just for his incomparable body of work but also as an inspiration to the modern journalists who are trying to sustain the continuing relevance of newspapers in their communities. Unlike most of today’s columnists, who can’t get beyond scribbling self-absorbed drivel about the ho-hum things that happened to them in their cubicles, at the breakfast table or while getting their hair cut, Mike wrote about real things happening to real people in a very real way. In the days before “crowd” and “source” became a single word, Mike effectively deputized the entire population of Chicago as his legmen, relying on readers to feed him the outraged and outrageous tips that enabled him in his prime to generate five gem-like columns a week. A working-class kid who grew up over his father’s saloon, set pins in a bowling alley and conned his way into journalism while in the Air Force because it looked like easy duty, Mike built a connection with his readers that was so strong that they dropped dime on him every time a bureaucrat bungled, an alderman fleeced or a city crew loafed. At Chicago’s Daily News, then the Sun-Times and finally the Tribune, Mike stood up for mothers fired for taking their kids to the doctor or a tavern keeper dispossessed by urban renewal. He deftly pilloried racists, liars, phonies, cheats and hypocrites of all sorts, which is to say he covered a lot of politics. And he never stopped needling the Chicago Cubs, the team he hated to love. Mike built his columns with facts and hard reporting, a craft he mastered at City News Bureau of Chicago, the original hard-knocks school of journalism. Daley was not an articulate man, most English teachers would agree. People from other parts of the country sometimes marveled that a politician who fractured the language so thoroughly could be taken so seriously. Well, Chicago is not an articulate town, Saul Bellow notwithstanding. Maybe it's because so many of us aren't that far removed from parents and grandparents who knew only bits and pieces of the language. So when Daley slid sideways into a sentence, or didn't exit from the same paragraph he entered, it amused us. But it didn't sound that different than the way most of us talk. Mike won his column in 1964 after he and several other reporters were asked to audition for the role by writing sample columns. The other writers saw this as an opportunity to slide some favorable ink to their favorite sources, recalls Ed Baumann, a legendary Chicago newsman in his own right. The column about little guys by a writer who sounded like a little guy himself was an instant hit. In return, Mike’s devoted band of cops, pols, barkeeps, fixers, flacks, sports nuts and other self-appointed citizen journalists gave him all the raw material he needed to keep the magic going. Their loyalty probably kept the Daily News alive far longer than the struggling afternoon newspaper otherwise might have lasted. Mike’s work had passion, personality and real people – lots of people – that readers could identify with. And he even earned the respect of his targets. When photographer Richard Derk trekked across the blizzard-paralyzed city to take pictures of a street that had been plowed perfectly clear for a mafia kingpin, he was surrounded by a menacing group of thugs when he arrived at his assignment. “What the #$%& are you doing?” the leader asked Richard, who today is photo editor of the Los Angeles Times. Richard nervously told the men about the upcoming column. While the new, far-reaching strategic alliance with a dozen newspaper companies is a major coup for Yahoo, the advantage to the participating publishers is far more modest. The juiciest part of the deal, by far, is that publishers will assign thousands of their well-placed, well-paid account representatives to sell ads for Yahoo, giving the mega-portal unprecedented access to the most feet on the street in each of the markets served by the newspapers. Local advertising is the Holy Grail of future growth for the likes of Google, Yahoo and, to a lesser extent, such online publishers as Microsoft, AOL and a few other contenders. Until now, none of the digital biggies could find a cost-effective way to crack this market. The Yahoo deal will show them how. The online advertising revenues of Yahoo and Google to date have grown primarily through the sale of the keyword ads adjacent to the results of almost every search. Merchants buy these ads at slick, self-service web sites that involve zero human interaction. While self-serve keyword advertising has grown explosively to some $6.7 billion in 2006, no one believes this pace will last forever. So, all the big online media companies have been trying to crack the local advertising markets dominated by the traditional print and broadcast media. But the online companies have barely any sales representatives to match the thousands of people newspapers employ to sell everything from ROP advertising to Sunday inserts to used-car ads. And the delectably profitable economics of online publishing make it impossible to hire enough people to come close to matching the number of ad reps in place at every newspaper in the land. In a single brilliant stroke, Yahoo solved this problem by gaining access to the combined sales forces of such publishers as Belo, Hearst, McClatchy, Media News and eight others. Better still, the deal will prevent Google and others from gaining access to the same sales crews. Even better, from Yahoo’s point of view, the publishers will bear the full expense of the sales effort. So, Yahoo essentially will spend nothing to lock up the largest, most experienced and best-connected local sales force in every market participating in the program. And what do the publishers get? A share of the revenues from (i) ads they sell to local merchants, (ii) classified advertising they sell into HotJobs and Yahoo Cars, (iii) any ads Yahoo sells to national advertisers and (iv) the ads appearing in the Yahoo search boxes soon to be added to their pages. Note: Some of the publishers participating in the alliance may not be selling Yahoo job or auto ads because of prior relationships with CareerBuilder, Monster or Cars.Com. Another appeal for newspapers is that Yahoo News will point additional traffic to their sites, which ought to enable both parties to increase their traffic, page views and advertising inventory. Without a doubt, all of these elements do create new value for newspapers struggling to adapt comfortably to the digital realm. But they could have done a lot better for themselves, if, for example, they had the foresight years ago to have gotten together to create their own search company or aggregated news site. Instead, they are forced today to rely on the kindness of Yahoo. Newspapers still have ample opportunities to create innovative print and digital products to endear themselves to their readers, non-readers and advertisers. The danger of the Yahoo deal is that publishers might mistake the resulting revenue boost as being the franchise-saving new media strategy they had been hoping for. Some thoughtful commentators (here and here) have asked what would possess guys like Mark Potts and me to speculate that growing investor pressures may – repeat, may – force structural changes at the New York Times Co. The effort to force the NYT Co. to give its public stockholders more control over the company was launched publicly a year ago by the manager of a major Morgan Stanley investment fund. Hassan Elmasry, managing director of Morgan Stanley Investment Management Ltd., rounded up the votes of 30% of the company’s shareholders to oppose the slate of directors proposed by the controlling Ochs-Sulzberger family. He is reprising the effort this year. Now, why would Mr. Elmasry do that? With literally a world of investment alternatives available to him, why would a sophisticated fund manager bother to pick a public fight with one of his portfolio companies – especially when it would be far easier to quietly sell the shares and deploy the assets more effectively someplace else? And why would he pick a fight with a family who until earlier this year had left $675 million in assets in his firm’s care? Although NYT stock has fallen by 5% to $24.10 in the year since Mr. Elmasry launched the vote boycott, he could have sold his shares within the last 60 days for as much as $26.90. If he has kept his shares (public records are not sufficiently up to date to confirm whether he did), why would he be doing so? If Mr. Elmasry were inclined to divest his holdings, why would be conducting a high-profile campaign criticizing the management and board structure of the company? With the family controlling 9 of the company’s 13 board seats and the newspaper M&A market depressed, it must be clear to Mr. Elmasry that NYT is not likely to be forced to the auction block in the way that Tribune Co. and Knight Ridder were. Why would he continue hanging on to the shares? When Mr. Elmasry launched his campaign a year ago, his fund owned approximately 5% of the company’s outstanding stock. As of Dec. 31, his firm held 7% of its shares. Why did he accumulate more shares? If you presume Mr. Elmasry and his firm are rational investors, which I do, then you can’t help but conclude, as I do, that they have a carefully conceived strategy to shake things up at NYT Co. I don’t profess to know whether or how it might happen. But I smell smoke. In another example of the magical thinking that sometimes passes for the real thing in publishing, some people are embracing the idea that newspapers could continue in the future as break-even businesses subsidized by the profits of their online operations. Wrong. If, heaven forbid, print profits were anywhere near being on a trajectory to nil, investors would bail out of publishing companies well before the distant theoretical point that new media operations reached sufficient critical mass to replace the revenues and profits of print. Investors would be wise to flee, too, because online sales and profits – even though they are growing at robust double-digit rates – are not going to be anywhere near capable over the next 10 years of delivering a sufficient return to merit the substantial investment in big iron required to produce and deliver a print product. If print sales and profits dried up to the point that newspapers truly were only breaking even, their managements would have to abandon the print product or risk being cashiered by their investors. So, break-even is not an option for print. And the magical thinking that conjures such improbable scenarios is no substitute for objective analysis, realistic strategies and concrete action. My friend’s theory is that the fixed costs of publishing the daily paper will remain, well, fixed – running the presses, buying newsprint and ink, operating delivery trucks and paying carriers, employing photographers and reporters and editors and so forth. Over time…those costs will essentially match the revenue of the daily print edition – so it will neither make nor lose money. The publisher…will remain profitable by generating healthy margins on all the related products it offers. The chief problem with this economic fantasy is that print still delivers some 90% of the revenues at most newspapers. Even though online (and niche print products) may generate higher operating margins than the industry range of 20% to 30%, the profits coming from this relatively small volume of sales will not produce the absolute dollars necessary to make up for the absence of, or even a material decline in, print profitability. Advisory: If you as math-averse as I am, you can TiVo through the technical stuff in the next three paragraphs and skip to “Conclusion.” If you proceed, please do not do so while operating heavy machinery. The first of the two graphs below shows what would happen to the sales and profits of a hypothetical newspaper company whose print operations moved from a generous (but not unheard of) operating margin of nearly 29% today to negligible profits at the end of 10 years. In the same period, online operations would increase at hefty double-digit rates over the decade to deliver 50% of the company’s total sales and 100% of its operating profits. Assuming a linear drop in print sales and profits each year on the way to break even, profits for the entire company would slip from $1.2 billion in Year 1 and continue falling annually until stabilizing at less than half that amount in Year 4 and thereafter. Once online sales grew to the point that they were delivering nearly a third of the revenues in Year 7, profitability would begin to improve slightly. But the consolidated earnings of $800 million in Year 10 still would be only two-thirds of where they started in Year 1. Even though sales exceed the $4 billion level in the out-years, the company’s profitability of 17% in Year 10 is 41% lower than where it started in Year 1. That’s because the newspaper isn’t making any money. So, what does it all mean? Glad you asked. Like many big manufacturing businesses, newspapers require a huge investment in plant, fleet and other equipment to produce their print products. When investors put money into a company to help buy such assets, they require them to produce sufficiently high profits to merit the continued use of their money. If the assets fail to produce adequately, the investors first pressure the management to improve the profitability of operations, then agitate for new management and, if still unsatisfied, demand the sale or liquidation of the business. Sound familiar? 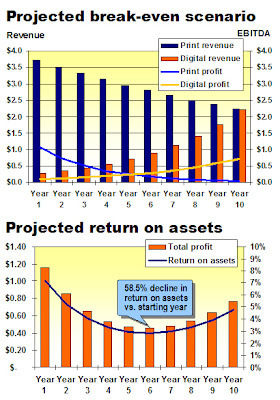 If profits were to deteriorate as badly as discussed in the three above paragraphs you skipped, the return on assets (illustrated in the second graph below) would drop from 7.2% in Year 1 to an unacceptably low 2.8% by Year 6. No investor would sit still for that sort of deterioration. Before that happened, investors either would demand a sharp improvement in print profitability or demand that the presses be stopped permanently. In other words, newspapers will go out of business before anyone ever lets them operate on a break-even basis. To comfortably maintain control of the New York Times Co., the Ochs-Sulzberger family may have no alternative but to follow the Tribune Co. in a highly leveraged transaction to remove their company from public ownership. Based on the economics of the pending Tribune deal and the insatiable appetite of junk-bond investors willing to finance aggressively leveraged transactions, NYT Co. could take itself private by increasing its $1.5 billion debt load by up to three times. In that event, as discussed previously here, the transaction might well require sharp reductions in the abundant staff, bureaus, travel budgets and other resources that make the New York Times the newspaper of record for the world’s largest and most powerful democracy. The family may have no choice about taking the company private, owing to the escalating pressure from dissatisfied public shareholders to abandon the two-tier stock structure that gives the clan effective control over a company whose operating profits of 16.3% in the last 12 months seriously trail the industry average of 23.5% (see graph below). Two major groups of public shareholders are asking fellow investors to withhold their votes for the management slate of directors at the annual meeting on April 24. The two-tier stock structure gives the family 9 of the 13 board votes – and thus effective control of the business until such time as the structure is modified. So, the company is in no immediate danger of a change of control. (UPDATED: See additional discussion in Comments section below.) However, the disenchanted investors have the means to intensify pressure on the family to either (i) give public shareholders more control over the business, (ii) sell the company or (iii) follow Tribune’s lead by buying out the public holders to take the company private. Unless the family wants to exit the newspaper business (and there is no sign of that), then private ownership would seem to be the most appealing of the three alternatives. The NYT Co. could purchase its outstanding public shares for about $4 billion, assuming a 20% premium over the stock’s current value of $23.42 a share. The family could finance the purchase by taking on more debt, selling assets and/or raising cash from a compatible investor willing to hold a minority stake in the business. Given the generous tax benefits associated with an employee stock ownership plan, the family might elect to take a page from the Tribune deal by adding an ESOP to its going-private plan. But the same end could be achieved without one, too. If the $4 billion required to buy the stock were added to NYT’s existing debt of $1.5 billion, the resulting debt burden would be a prohibitively high 11 times the company’s operating profits of $511 million in the last 12 months. By contrast, the contemplated financing for Tribune, which would make it one of the most leveraged media companies in the land, is 9.2x its trailing earnings before interest, taxes, depreciation and amortization. :: The ailing Boston Globe and its associated properties, whose value in my estimation is about $650 million. :: The International Herald Tribune (estimated value: $150 million). :: Elements of its regional newspaper group (estimated value of the entire group: $900 million). NYT bought About.Com for $410 million in 2005 but is unlikely to part with its largest new-media franchise. The more properties the company sells, the more it could reduce its debt and the less it would be forced to cut operating expenses at the New York Times. Thus, the future of the crown jewel of American journalism may well depend on how many other jewels the family is willing to sell. The plan to take Tribune Co. private will push aggressively the envelope of how much a newspaper-heavy media company can borrow in a period of constricting audiences and sagging advertising revenues. There’s nothing wrong with loading a company with lots of debt, if you have a plan to build sales, boost profits and generate enough cash to service an imposing schedule of escalating principal and interest payments. But tardy payments – or, worse, a default – would prove disastrous to the company; its new investor, Sam Zell, and possibly its new employee stock ownership plan. To ensure Tribune can satisfy its demanding new debt covenants, the company appears to have no alternative but to reduce expenses sharply throughout the operation and take a hard look at selling more assets than the lovable but ill-starred Chicago Cubs. Raising sales would be nice, too. But there would be scant margin for error. To fund the planned buyout, Tribune Co. will raise its debt load by 167% to a formidable $13.4 billion from the present $5 billion, according to analyst Alexia Quadrani of Bear Stearns. 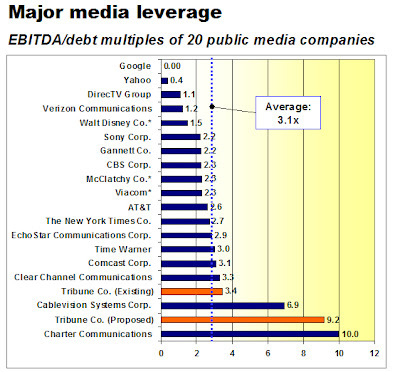 The new debt, which will be 9.2 times the company’s operating earnings, will make Tribune the second most leveraged of the 20 largest public media companies, as illustrated in the graph below. Leverage is determined by the ratio of debt to a company’s earnings before interest, taxes, depreciation and amortization (EBITDA). Lenders pay close attention to this ratio in evaluating a company’s likely ability to repay its loans. Most bankers these days draw the line at lending roughly 7.5x earnings for newspaper companies. Highly leveraged companies, which the Tribune appears set to become, pay greater interest rates on their loans than less-levered companies to offset the risk of potential default, thus increasing operating expenses. Immediately after learning of Tribune's planned financing, two independent bond-rating agencies plunged the company's issues to further into junk territory, instantly raising its borrowing costs. Higher borrowing costs mean the compnay will need to devote even more of its profits to debt service. The leverage planned for Tribune is three times greater than the average debt-to-earnings ratio of 3.1x for the 20 largest publicly held media companies. 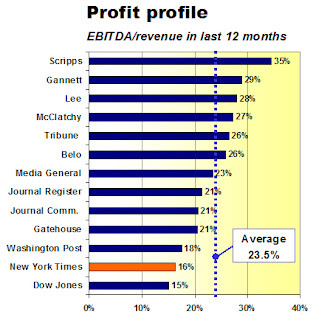 By contrast, the debt of Gannett and McClatchy, respectively the largest and second-largest newspaper publishers, is 2.2x and 2.3x their EBITDA over the prior 12 months. The only publicly held media company with a greater debt burden than planned for Tribune is Charter Communications, a cable-television operator with a 10x debt-to-earnings ratio. The most highly leveraged company after Tribune would be Cablevision Systems, another cable company, which has borrowed 6.9x its earnings over the last 12 months. At the other end of the continuum, Google has zero debt and Yahoo has borrowed only 0.4x its earnings. These new-media powerhouses are generating so much cash from their expanding operations that they don’t need to borrow money to finance their growth. As a newspaperman-turned-cable-guy, I can tell you that the economics of the cable industry are far more predictable than those of the modern newspaper industry. If Tribune Co. goes through with the massive borrowing that appears to lie in its future, the new mega-millionaires running Tribune Tower in Chicago will be taking a big leap of faith in their ability to increase sales, cut expenses and raise earnings. Here’s hoping they look carefully before they leap. When the parent company of the Milwaukee Journal went public in 2003, the event produced once-in-a-lifetime windfalls for 2,250 staffers who had invested in its employee stock ownership plan. For secretaries, printers, editors or any other employee who invested regularly in the Journal Communications ESOP in the 10 years prior to the IPO of the Milwaukee company, the offering delivered a gain of nearly tenfold, according to the New York Times. “Where [else] could we have ever done this?” said a bookkeeper after learning she was an instant millionaire. Thanks to a benevolent owner who placed 90% of his company in the hands of its workers, Journal Communications was a successful ESOP. Perhaps the saddest part of the story is that barely more than a third of the company’s 6,000 employees took advantage of this extraordinary opportunity. But not every ESOP leads to a happy landing, as the more than 70,000 employees of United Airlines learned after purchasing 55% of their company with their retirement funds in 1994. When United declared bankruptcy in December, 2002, the employees of the largest ESOP in history lost approximately two-thirds of the $3.3 billion invested in the plan, according to documents filed in an unsuccessful class-action suit seeking to recover the loss. Although the idea of workers owning a piece of the company employing them sounds positively Marxist, an ESOP really is a clever capitalist tool enabling a business owner to cash out of a significant portion of his company while saving on taxes and retaining control of the enterprise. In typical circumstances, employees investing in the ESOP don’t get to see the company's financial information and have no vote in its management. Enabled by federal legislation in the 1970s, ESOPs deliver tons of favorable tax treatment to a company. When the owner of a business puts seed money into an ESOP intended to fund the eventual buyout of a portion of his company, he gets a tax deduction equal to the amount of money funding the plan, as well as deductions for the principal and interest on any loan he takes out to create it. In the case of Tribune, immediate tax benefits will be generated from the $250 million put into creating an ESOP in the first stage of the complicated, multi-step transaction that will take it private, according to a company press release. The tax breaks get better when the owner actually sells some of his holdings to the ESOP. If an ESOP buys 30% or more of a C corporation from the owner, then all the gains of the sale are tax free to the owner, so long as the proceeds are held in qualified investments. The structure planned for Tribune appears to build in an immediate gain for the ESOP, along with an accompanying tax benefit for the current investors who sell their shares in the business. The ESOP is scheduled to be funded at $28 a share and then rolled into a structure priced at $34 a share, generating an 21.4% gain in perhaps less than 12 months. The Tribune Co. will be structured as subchapter S corporation, insulating it from the requirement of paying coporate taxes and, thus, enabling it to keep more cash in the business. S corporations pass all profits (or losses) to individual shareholders, who are responsible for paying any resulting taxes. While profits always are good, tax losses also can valuable to investors like San Zell, who may want to reduce the taxes owed on gains from other projects with certain near-term losses generated by Tribune Co. The Trib's ESOP would not be responsible for paying any taxes, though individual employee shareholders would have to pay taxes on any gain they realize when they eventually sell their shares. While participation in the Journal Communications plan was voluntary and the company even arranged low-interest loans for employees who wanted to buy more shares than they otherwise could afford, the Tribune plan will be solely funded by the company as part of multi-tier retirement program. Unlike the United plan, Tribune employees eligible for 401(k) retirement accounts will be able to continue to invest in those accounts and, thus, diversify their pension portfolios. As demonstrated in Milwaukee, ESOPs can be a beautiful thing for employees when a company is successful. But they can be a nightmare if things go wrong. If most or all of employee retirement funds are invested in a company’s ESOP, as was the case at United, then the collapse of the business could wipe out everyone’s pension. If the company itself goes out of business, as happened to one former General Motors unit purchased by its workers, then people would lose not only their pensions but also their jobs. :: Restructuring as an ESOP will enable Tribune to efficiently raise cash to buy the shares of such dissident shareholders as the Chandler family, while enabling the departing shareholders to shield much, if not all, of any gains from taxes. :: The tax advantages associated with an ESOP will enable Tribune to save on the costs of borrowing money, thus providing more working cash, lowering borrowing costs and potentially enhancing profitability. This will give Tribune a less-dear alternative to outside financing. :: With additional cash available to fund the business, Tribune either could pay investors higher dividends or use the funds to make strategic investments for the future in niche print products, new-media projects and the like. :: Operating as a private company no longer required to satisfy unrealistic Wall Street expectations from quarter to quarter, Tribune can take a longer-term view of its business. Although the tax and financing benefits of an ESOP might put a bit less pressure on the company to cut expenses than public or private ownership funded by private-equity investors the continuing uncertain revenue environment for newspapers may persuade management that it is prudent to reduce such expenses as headcount, newsprint consumption, television programming and more. Advocates say ESOPs improve sales and cut expenses by raising productivity and morale. It remains to be seen whether an ESOP will turn Tribune into the Promised Land. But the company's anxious employees probably are more than happy this Pascal season to be coming to the end of what must have felt like 40 years of wandering in the desert.